Marylyn Ruth Arrington, 81, of Hannibal, MO went to be with the Lord her Savior at 8:08 p.m. Monday, April 30, 2018, at Blessing Hospital in Quincy, IL. Memorial services will be held 5:00 p.m. Friday, May 11, 2018, at Oakwood Christian Church in Hannibal, MO. Pastor Tom Day will officiate. Marylyn was born on December 19, 1936, in Hannibal, MO the daughter of Edward and Mildred Louise (DeLaPorte) Ward, Sr.
She was previously married to Raymond Young and he preceded her in death. Marylyn later married Kenneth James Arrington and he also preceded her in death. Survivors include four daughters, Leslie Young of California, Laura Lee Liebes (Stephen) of California, Julie Ann Young of Hannibal, MO, and Tracy Bost (Michael Leroy, Jr.) of Hannibal, MO; one brother, Darrell David McKay (Debbie) of Hannibal, MO; seven grandchildren; numerous great grandchildren, nieces, nephews and cousins. 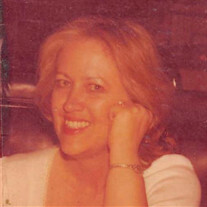 In addition to her parents and husbands, Mrs. Arrington was preceded in death by a son, Michael Dale Young; brother, Edward Ward, Jr.; sister, Bonnie Enderli; and grandson, Brandon Scott Apodac. Marylyn was a member of the Beta Sigma Phi Sorority. She loved doing arts & crafts, especially paintings. Marylyn also had a love for lilac's and roses, she enjoyed their smells and beautiful colors they cast upon her yard. Mrs. Arrington loved her family and cherished all the holidays, anniversary's and birthday's they spent together. Marylyn was a woman of faith and took great pride in loving the Lord. Mrs. Arrington attended Oakwood Christian Church when her health would allow her to do so. Memorial contributions may be made to Oakwood Christian Church, in care of the Smith Funeral Home & Chapel.